CAMP NAKAR, LUCENA, Quezon - The Southern Luzon Command (SOLCOM) of the Armed Forces of the Philippines (AFP) recently celebrated its 32nd founding anniversary at Camp Nakar, Lucena City which was highlighted by the awarding of medals to military awardees and plaque of recognition to SOLCOM reservist, stakeholders, and SOLCOM officers for the year 2019. This year’s celebration was anchored on the theme: “SOLCOM @32: Kaagapay ng Mamamayan para sa Kapayapaan at Kaunlaran ng Timog Luzon” where Defense Secretary Delfin Lorenzana was the guest of honor and speaker. Sec. 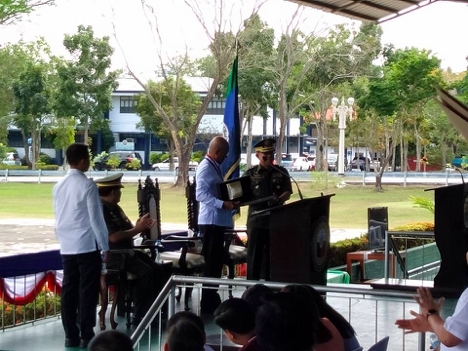 Lorenzana and SOLCOM Commander Lt. Gen. Gilbert Gapay led the awarding of medals and plaques of recognition and appreciation to the 23 awardees. The military awardees include: CPT. JanJan B. Siatriz (Gold Cross Medal); LTC Jhon Oliver F. Gabun (Silver Cross Medal); MSg Jodel S. Sabio (Silver Cross Medal); Col. Arcangel G. Gamido Jr. (Meritorious Achievement Medal); Col. Rosalio G. Pompa (Gawad sa Kaunlaran); 2Lt. Bernalyn A. Aguilar (Military Merit Medal). Other awardees were Ronaldo G. Bulfa- HSOLCOM Reservist officer of the Year-2019; MSg Louie P. Pacunla- HSOLCOM Reservist Enlisted Personnel of the Year-2019; Maj. Arthur Eamiguel- HSOLCOM Officer of the Year-2019; Tsg. Eduardo C. Morales-HSOLCOM Enlisted Personnel of the Year-2019 and Raymart B. Dalusung – HSOLCOM Civilian Employee of the Year-2019. HQS SOLCOM stakeholders awardees CY-2019 who received the plaque of recognition from SOLCOM were Soliman A. Villamin, Jr.- President and CEO of DV Boer International Corporation; Atty. Annalyn Sherry F Hibo –Gamboa, Chief Executive Officer of Estenias Science Foundation School and Sylvia H. Bulfane, Principal of barangay Castanas Elementary School, Sariaya, Quezon. Sec. Lorenzana also commended the following: 202nd(Unifier) Infantry Brigade, 21ID, PA under the leadership of BGen. Arnulfo Marcelo B. Burgos, Jr. for being the best Infantry Brigade CY-2019; Tactical Operations Group-5, TOWSOL, PAF under the leadership of LTC Melvin A. Banua for being the best tactical operations group for CY-2019 and Patrol Boat 343, Naval task Force 31. NFSL- PN under the leadership of LTJG Jael G. Francisco for being the best navy vessel of the year-2019. Defense Sec. Lorenzana congratulated the 23 awardees for their invaluable services rendered.